BETHESDA, Md., May 12, 2016 /PRNewswire/ -- HelioCampus, an analytics-as-a-service company committed to helping institutions make data informed decisions, continues to build upon its mission and strategy by appointing leading industry executives to the company's board of directors. HelioCampus' board members - Ray Henderson, Founding Partner, Lessons Learned Ventures LLC and former President and CTO at Blackboard, Burck Smith, CEO at StraighterLine, and Pete Young, SVP for Analytics, Planning and Technology and CIO at University of Maryland University College (UMUC) - bring expertise and acumen to support HelioCampus' efforts to help institutions make faster, more informed decisions. "We are focused on partnering with innovative leaders who are committed to serving higher education and helping accelerate the path to improved student outcomes and overall institutional effectiveness," said Darren Catalano, CEO at HelioCampus. "The fundamental relationship between expenses, revenues, and educational outcomes are being explored anew by higher education institutions," said Ray Henderson. "HelioCampus offers a platform and approach for applying data science to address complex challenges faced by educational leadership. Through the application of guided analysis to fundamental questions of institutional effectiveness and goal achievement, their model supports the evolution of a data-driven culture in leadership teams." "Visibility into, and an understanding of the key factors that impact financial sustainability are necessities for leaders to make progress against costly institutional problems and improve the overall health of the institution," states Burck Smith. "This is a becoming a pre-condition to get into the data science world." "After much success within the University System of Maryland, the USM Board of Regents approved a plan to spin off the UMUC Office of Analytics into a new company," said Pete Young. "Institutions are at varying levels of maturity when it comes to data analytics. HelioCampus' goal is to help them evolve, from whatever their starting point may be, to a state of advanced, institution-wide analytics." "HelioCampus was created to provide an alternative to the traditional business intelligence solutions available in the market," said Catalano. "Having honed our data analysis and storytelling skills in a university setting, we deeply understand the dynamic culture, challenges and opportunities that face higher education today. Recognizing the inefficiencies and significant cost involved for every institution to build this capability in-house, we developed a new model to reduce the time and cost for institutions to build an advanced analytics capability on campus." For more information, please visit www.heliocampus.com. 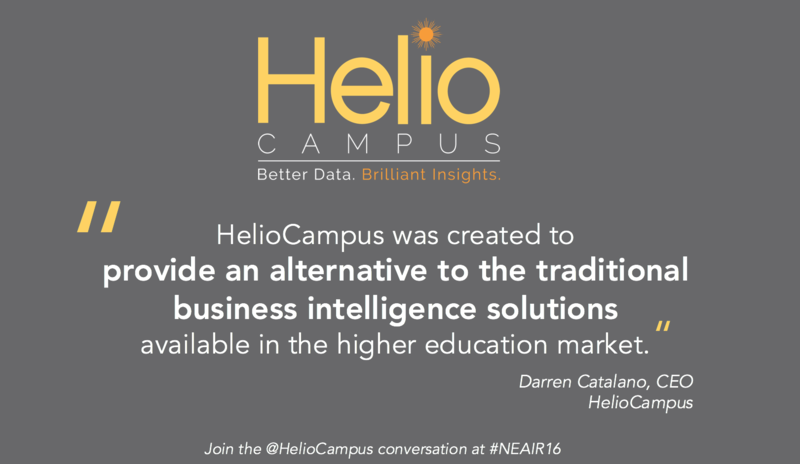 HelioCampus is an analytics-as-a-service company for higher education. Easy to use and understand, the HelioCampus model consolidates and presents institutional data in ways that enable leaders to make faster, more informed decisions.